This lovely detached house is positioned in a quiet rural hamlet and offers character accommodation with spacious rooms, a large farmhouse kitchen and 3 bedrooms. The outside dining area adds a very pleasant living space to the property. There are paddocks, outbuildings and 2 stables. The nearest Bridleway is just 300m from the house. Viewing is highly recommended. 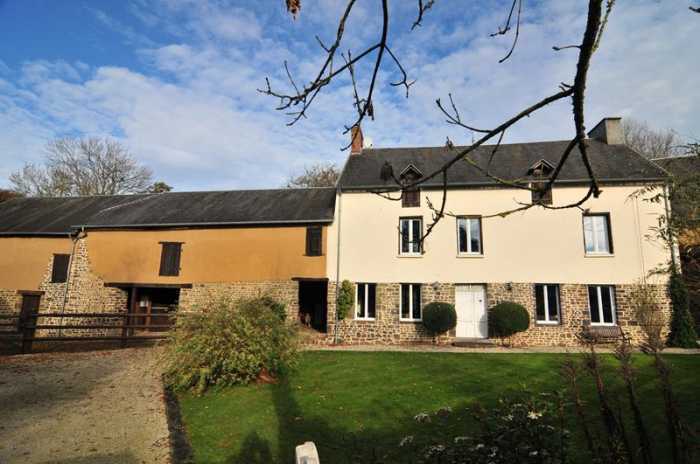 The property is located in the Normandy region of France, a 10 minute drive from Saint-Lô, the department capital. The nearest small town is Torigni-sur-Vire which is about 3 km from the property and offers all amenities. The closest airport to the property is Dinard Airport (94km), slightly further afield are Deauville Airport (80 km), Rennes Airport (143 km) or St. Brieuc Airport (191 km). It is 404 km from the cross channel tunnel at Calais and the ferry port at Caen Ouistreham is about 40 minutes drive. Nearby tourist attractions are Coutances Cathedral (43km), the Bayeux Tapestry (Musée de la Tapisserie de Bayeux) (41 km), D-Day Landing Beaches (44 km) or the UNESCO heritage site at Mont St Michel (75 km). Excellent transport links are available on the nearby A84 motorway which is a 5 minute drive away. Entrance Hall/Study Area 5.54 x 2.53m Wood flooring. Double doors to front and window to rear elevations. Original oak stairs to first floor. Radiator. Built-in shelving. Kitchen/Dining Room 5.92 x 4.02m Sliding patio doors to rear and 2 windows to front elevations. Tiled floor. Inset spotlights. Radiator. Fireplace with wood-burner. Built-in cupboard. Partly glazed door to open fronted covered seating area. Breakfast bar. Telephone socket. Matching base and wall units including electric hob with extractor over. Built-in oven and dishwasher. Space for under counter fridge/freezer. Single stainless steel sink with mixer tap. Worktops and tiled splash-backs. Lounge 5.91 x 3.81m 2 windows to front and glazed French doors to rear elevations. Radiator. Built-in shelves. Fireplace with wood-burner. Landing Wood flooring. 2 windows to front elevation. Ornamental fireplace. Built-in cupboard Radiator. Door to stairs to loft with cupboard under. Bedroom 1 5.48 x 3.85m Window to front and rear elevations. Ornamental fireplace. Wood flooring. Radiator. Built-in cupboard. Bedroom 2 3.83 x 2.89m Window to rear elevation. Wood flooring. Radiator. Built-in wardrobe with sliding doors. Cloakroom WC. Pedestal basin. Wood flooring. Bathroom 2.84 x 2.72m Wood flooring. Window to rear elevation. Pedestal basin. Radiator. WC. Shower. Bath with tiled surround. Inset spotlights. Bedroom 3 7.55 x 5.06m 4 radiators. Window to front and 2 Velux windows to rear elevations. Exposed “A” frame. Built-in shelving. Sloping ceilings. Attached open fronted dining area 7.55 x 5.06m Concrete floor. Double wooden doors to rear elevation. Detached Barn 11.54 x 4.94m Constructed of stone and cob under a slate roof. Window and door openings. Valid Planning Permission to convert to a 3 bedroomed Gite. Open plan ground floor. Attached Open Fronted Double Car Port 6.70 x 5.18m. Double wooden gates lead to a gravel drive, parking and car port. Area of lawn and mature hedging with shrubs. Outside lighting. Post and rail fence to barn which is divided into 2 stables and tack room. Stable 1 4.44 x 3.90m. Stable 2 4.45 x 4.06m. Utility Room 4.77 x 3.74m Door to front elevation. Boiler and oil storage tank. Space and plumbing for washing machine. Stairs to loft space over stables and utility room 4.77 x 3.74m. Store Room 6.00 x 5.61m Door to front elevation. Electrics. Attached Open Fronted Barn 6.00 x 5.00m (approx.) with stairs up to loft. Cider press. The garden to the rear is laid to lawn with mature trees, flower and shrub borders. Well. The remaining land is divided into level paddocks with 2 field shelters. Mains water, telephone and electricity. Oil fired central heating. Drainage is to an all water septic tank installed in 2014. Broadband internet connection available.